Here is a free pattern for you to try. 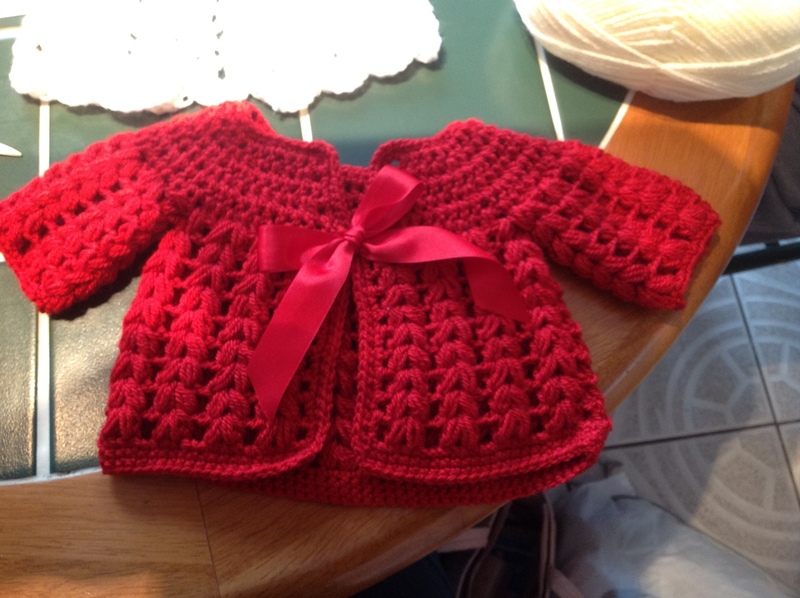 I used a size 4 crochet hook and double knit wool for the red and the grey cardigans. Whilst I tried a super soft organic cotton for the white one. All designs have been slightly adapted, so feel free to play around with different combinations. The red one has no button holes and is fastened with a big double satin ribbon. 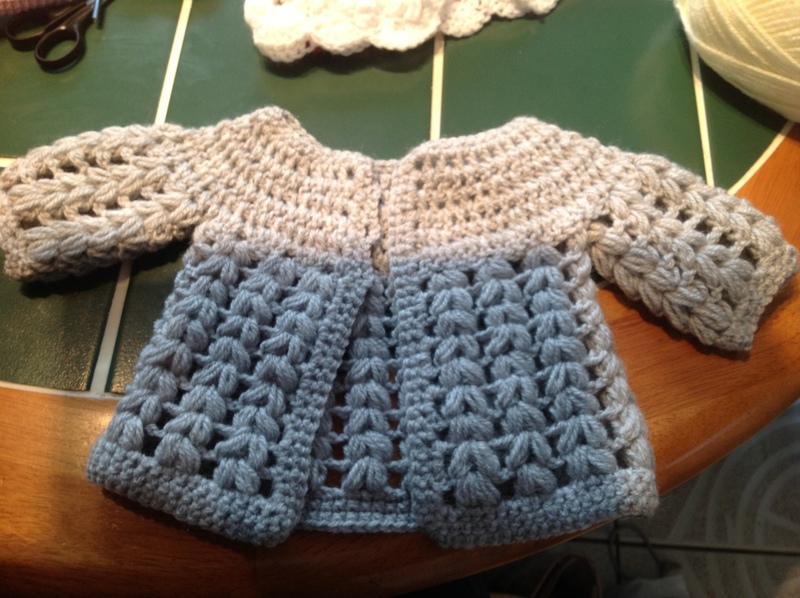 The grey cardigan has button holes (in the picture I have not sewn on the buttons yet … Couldn’t quite decide!) 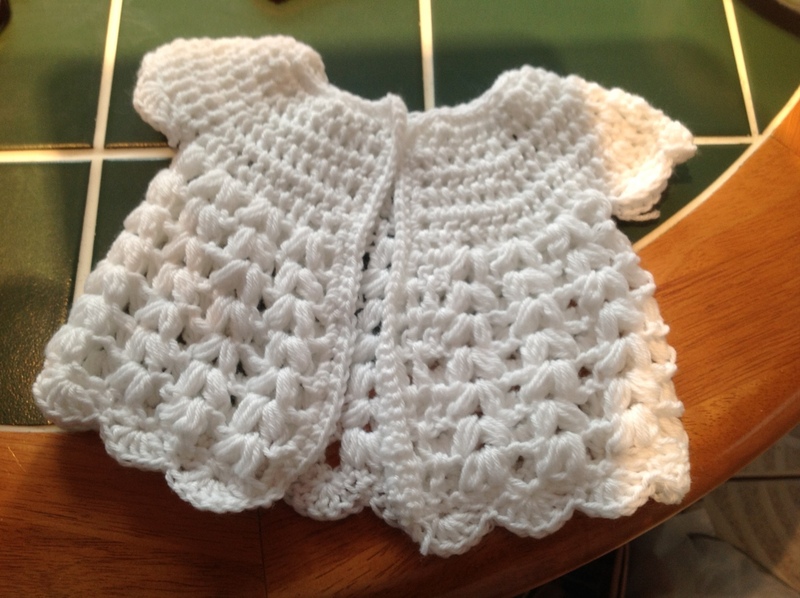 and the white cardigan has a scallop edge plus short sleeves finished again with a scallop edge. The possibilities are endless… So have a go at the basic design and then play! I would love to see your completed cardigans! Create a bobble again through same st.
1/2 bobble, 7 bobble sets, 1/2 bobble on the back plus two arm holes of 19 chains in each gap. When the cardigan is the required length ch 1, turn, double chain (dc) around the edge into every st. Repeat. I like to complete a third row of dc at the base of the cardigan to give a professional finish. Fasten off and weave in loose thread. Knot in yarn under arm to fasten the two bobbles together. Fasten off and repeat on other sleeve. This pattern has no button holes as I used a ribbon at the waist through two tr. On the second round of dc when you reach the desired side for button holes all you do is sacrifice some 2 dc’s, ch 3 instead and dc into 2nd ch from hook for as many buttonholes as you require. Now I think you will need to stock up on wool as this is a lovely little design. All I do for slightly larger and looser designs is increase the size of my hook and yarn. You can also add multiples of six to enlarge the design. This is due to the design requiring two extra bobbles (one for each side to keep it even). 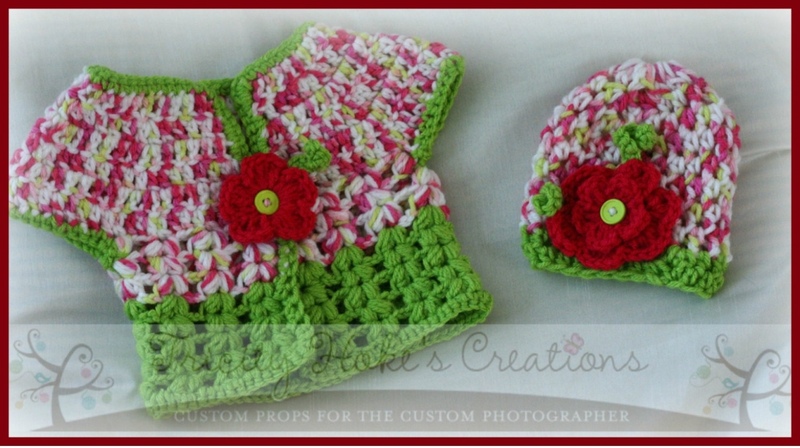 I am sooooo happy, other bloggers are using my patterns and sharing their creations with me! I am sooooo happy! Nice, I’m going to try it. I made one, it turned out great- you might like to see it: thegreendragonfly.wordpress.com/2012/08/20/grey-grey-grey/ thanks for sharing the pattern! Its a lovely pattern, thank you for sharing it with us! this is so pretty. thanks for the tutorial. I am trying to make your cardigan and ran into a problem when I started the row of bobbles. I didn’t have enough chains to follow the pattern. Could you please comment on how many total stitches are at the end of each row? I’d really appreciate it. 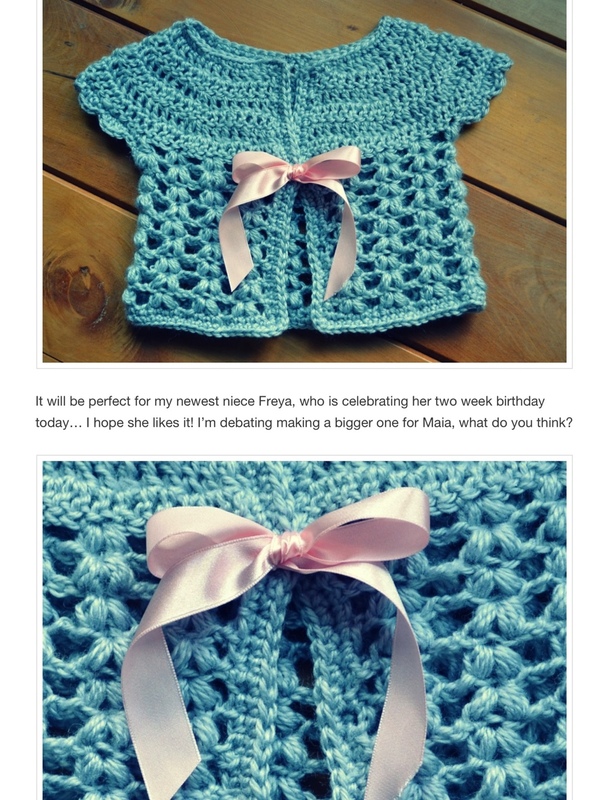 I love this cardigan and want to make it as baby gifts! Thank you so very much! I will attempt it and let you know how it goes! I thinks it’s adorable! So sorry to bother you again, but both my sister and myself have tried to make your cardigan after you added the stitch count to the end of each row and neither one of us can get it to work out. Does the chain 2 at the beginning of each row count as a stitch? I just don’t understand what we are doing wrong! Hello! I came across this pattern just love it! I am the editor of AllFreeCrochet.com and would love to feature your tutorial on my site with full credit to you. I know my readers would love it as well, and in return would generate some nice traffic to your site. If you agree and would like us to feature your project, our readers will simply click the link to your blog to get your full tutorial. It’s really that simple. Please let me know if this would be ok. I look forward to hearing from you! Aw thank you for the compliments! I would love for you to feature m pattern! Feel free to feature whatever you think your followers would like. I’m working on a few different ones now, but I got a little side tracked this evening as I scaled the cardigan down … Just about to write a blog on my kitty creation hahaha! I really am flattered by this offer! So thank you very much! That is really pretty. Congratulations! I couldn’t resist and held out long enough! Lol! Your update is what led me to this page. The new one looks great. I don’t have anyone to make if for, but if one day I do this will be on the top of the list. That is wonderful. The blue one is so nice. I hope the sales go well for you. These are stunning – I would like to make one for a friend who is due over christmas – please could you advice how much yarn I will need and also did you have more sucess with 4 or 8 ply? 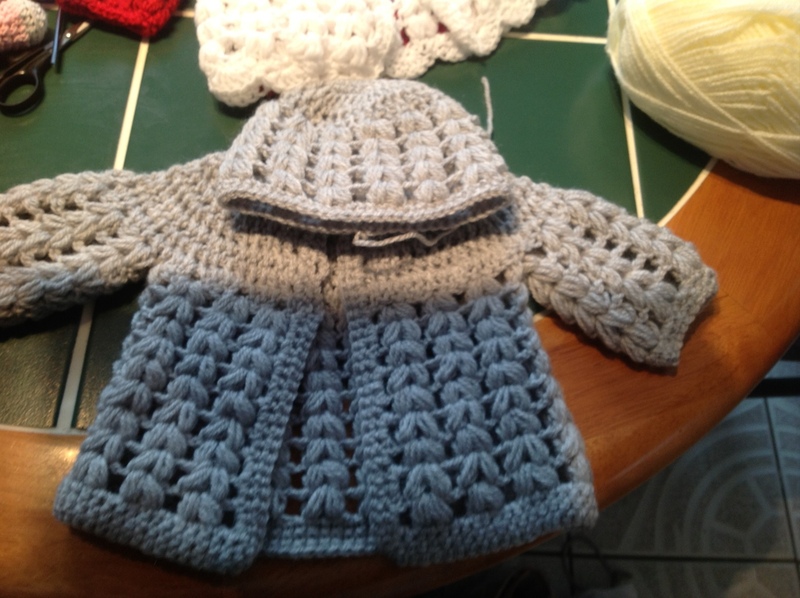 Thank you for sharing such a cute project – I am very much looking forward to trying it! Thank you so much – great info – now to find some gorgoes hand died merino yarn and get started – I will definatly email you a pic of the finished cardi. This will be my first proper cardi – I make wee rap around tops for the premi babys at our local hospital mostly – that is as far as I’ve got so this is really branching out for me 🙂 Our cat loves to chase the balls of yarn 🙂 Thank you again for the pattern – I’m quite excited to get started. Wow that sounds beautiful! I can’t wait to see it 🙂 what a wonderful thing to do for families at such tough times! My cats are cheeky as today we came home to a yarn spider web ALL OVER our living space … It’s a huge space 30m x40m, they managed to get a whole ball of some expensive organic cotton yarn AND a spool of thread, intricately weaving their web as a welcome home present! They were really cute though as they met us at the door and led us into their creation lol! I think they were proud of their ‘present’! Lol! Oooo I love them! look so pretty. will definitely try it for a doll size. thanks for the pattern. I just finished mine! Cute pattern.